St Basil's Cathedral, Moscow, Russia. 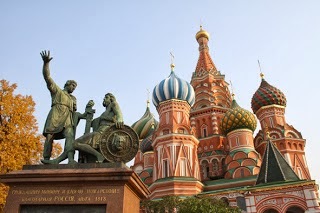 Few buildings say Russia more than the candy-cane domes of St Basil’s Cathedral under the walls of the Kremlin and overlooking Red Square in Moscow. Nobody knows who designed it, though legend says Ivan the Terrible had the architect’s eyes put out so he’d never create anything else again to rival its beauty. It’s certainly a compelling building, every dome differently decorated in almost garish, Willy Wonka colours. Interior of St Basil's Cathedral, Moscow, Russia. Surprisingly few people – and hardly any of the river-cruise tour groups – visit the interior, which is a shame. If you have free time after the tour of the Krelim that is always included on Russian river cruises, then pop in for a look yourself. 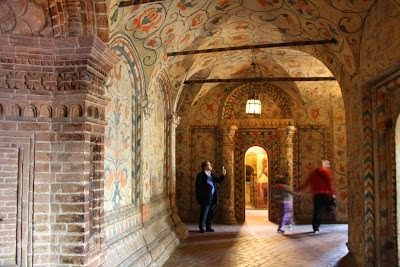 It’s quite a contrast to the cheerful exterior, with shadowy chapels (nine in all) connected by arched corridors and staircases that provide some of the menace of medieval Russia. Every chapel is different, and the tomb of St Basil himself is splendid in red and gold. When we were there, a choir was busking to raise funds for renovations. The beautiful liturgical singing echoed right through the building and accompanied us on our exploration. Nothing is more evocative of old Russia than its shadowy, icon-filled churches and cathedrals. Outside, they’re a flamboyant collection of medieval onion domes in swirling stripes, or a baroque whimsy in pink and blue, or sport glittering gold domes that bulge as if about to pop. Inside, they’re often dark and dramatic, sauna-hot and shimmering with candles. Sad-faced saints look down from walls onto whispering women in headscarves, and priests chant like the droning of a thousand bees. 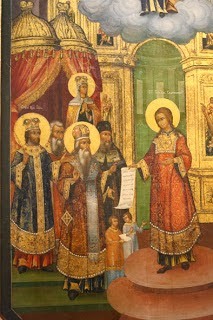 Russia’s churches are also intertwined with its colourful and often violent history, commemorating saints and tsars, murdered princes and scheming aristocrats. These days, religious life is bouncing back in the post-Soviet era, and many churches in Russia are busy with young, mobile-toting priests and crowds of solemn worshippers. St Basil’s is an exception. It’s no longer a working church, but a museum with an entrance fee, but still solemn and beautiful. If you’ve visited St Basil’s Cathedral and have any fond memories you’d like to share, please join the conversation by leaving a comment below.